This week we have 2 wonderful guest designers. Ann from Creative Antics and Melanie Muenchinger from Hands, Head and Heart who have created amazing projects for this week's movie pick - the Princess Bride. 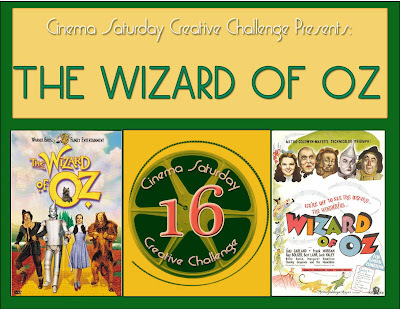 Please check out their blogs and the Cinema Saturday Creative Challenge for more details. I can't even tell you how excited we were to pick this movie. This movie (released in 1987) was originally a book (released in 1973) that slowly grew into a cult classic. I totally fell in love with the Princess Bride when I was in highschool. I think I was like Ann, and could quote the movie line by line. I think I must have watched it over a fifty times. One of my favorite memories is watching it with my highschool girlfriends at a slumber party eating popcorn and swooning over Westley's character and quoting all the memorable quotes (in our pajamas, with popcorn in our mouths) as the movie was on. One of my favorite lines from the movie is: "My brains, his steel, and your strength against sixty men, and you think a little head jiggle is supposed to make me happy? hmmm? " The other line that I love comes from Westley's devotion to Buttercup and how he expresses his love with the sentiment: "as you wish". For this card, I a stamp from Melanie's beautiful stamp set that I colored to show Princess Buttercup and Westley (Dread Pirate Roberts) holding hands with the sentiment as you wish being repeated in the circle again and again. I had so much fun making this card. I used the colors from the dress the Princess Buttercup wore and tried to mimic the beautiful beaded work in her dress by doodling with my silver pen. The pretty shimmery teal paper is from the Paper Temptress. I don't know if you have had a chance to check out this awesome company - but if you haven't - please check it out here. The papers are truly beautiful and exquisite. The sentiment "as you wish" was typed and repeated and then cut with my CM circle cutters. 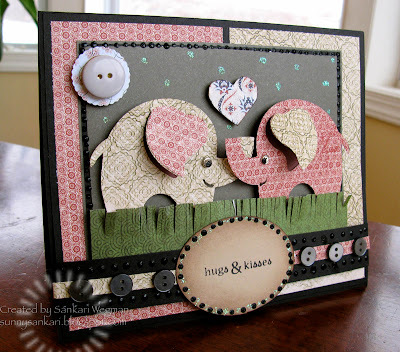 The beautiful stamp set is from Melanie Muenchinger's set. I hope you play along with the sketch and also with the Cinema Saturday movie. 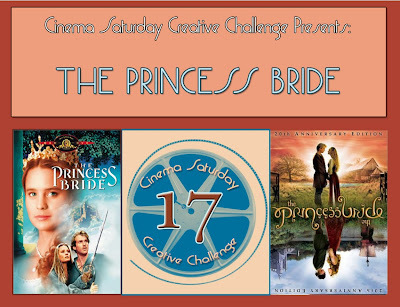 In order to be eligible to be eligible for the prize for this week's challenge, you have to use the sketch below with this week's movie which is the Princess Bride. I hope you have fun and try out the sketch and also try out the movie challenge. It has been so much fun to meet you all through these challenges! You are all such wonderful inspirations! Don't forget to check out the beautiful creations at Brooke's blog, Ann's blog and Melanie's blog!!! A big thanks to Ann and Melanie for guest designing and for making our 17th movie challenge so amazing and wonderful! Taylor is celebrating a year of Cupcake Challenges this week at her blog Taylored Expressions. 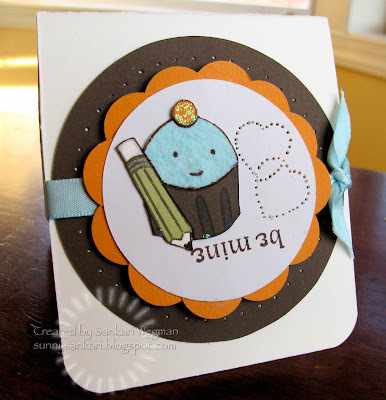 This is her sketch for this week's sketch challenge - and if you have cupcakes stamps - why not use them for this cupcake challenge. For her celebration, she had her design team come up with sketches too and asked all the featured cupcake samplers from this year to participate in those sketches. 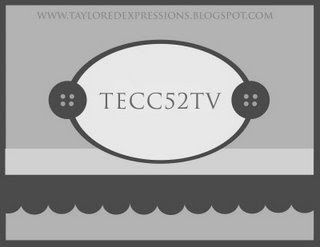 You can check out all the details on Taylor's blog. I hope all of you are doing well. Things here have gone from busy to insane! We are getting ready to head for warmer weather and so all the preparation has sucked up any craft time :( but I can't wait to soon! Wishing you a wonderful Tuesday filled with happiness and cupcakes! Hope you are all having a wonderful weekend! I am so excited to share with you some exciting news! 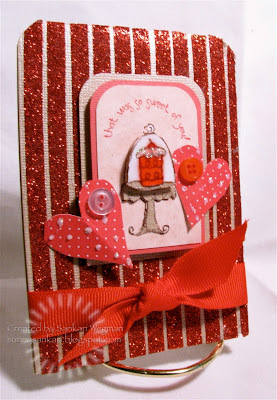 In December, I participated in Melanie Muenchinger's Hand-in-Hand sentimental journey challenge to create a card/project where hands are being featured. The winner of her challenge would get to be a guest desinger for Melanie in January and feature her latest stamps that are being released in January. I was soooo happy when Melanie selected my scrapbook layout and I got to be part of the release party of her newest stamps for Gina K. Designs. Melanie just released her newest set of awesome stamps called the The Best in Life. Melanie is the senior illustrator at Gina K. Designs and has some amazing stamps that she has created and her blog: Hands, Head and Heart is just filled with amazing cards, projects and stories. 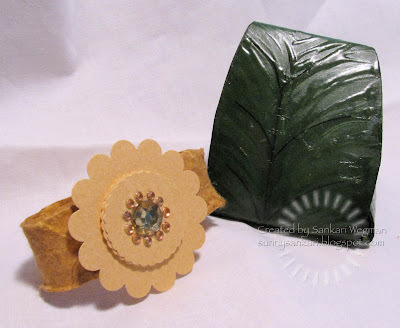 Check out all of Melanie's stamps here and check out all of Gina K.'s amazing products here.She is someone whose work I have totally admired and I was so excited to be picked! YAY! Thank you Melanie! This first one - I created using Melanie's The Best things in Life stamps and Gina's Warm and Cozy Christmas stamps and mixed the two together using Julee's awesome Mojo Monday sketch #70 I really loved making this card - because it was something I wanted to give to my MIL who is always so supportive and always such great care of our kids. These two little munckins in the their coats look just like our son and daughter. I loved the sentiment - from God - because no matter what your religious beliefs - children are a miracles. I paper pieced all the children's clothing and added alot of dimensionals to the card. The second one - I created a card for a very special friend and the sentiment that I created from Melanie's stamps are: "The Best things in Life are shared" - I loved this! 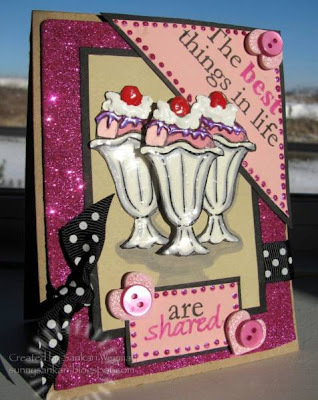 This card was created using the colors (black, kraft and pink) from the fabulous ladies at the Color Throwdown and uses Jen del Muro's sketch from last week. 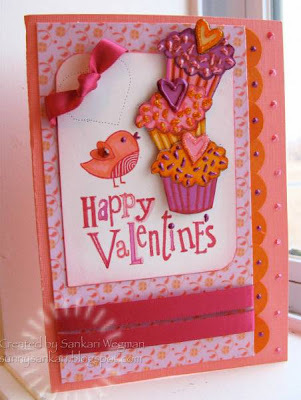 I loved using Melanie's stamps for this card for my friend. She is such a sweetheart and is always sharing and taking care of others. The sundae's on the card have liquid pearl and the glass on the sundae's have a liquid glaze on them. 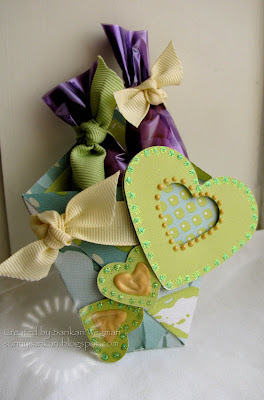 I have so many ideas spinning around in my head on projects to use with Melanie's stamps - there are so many. 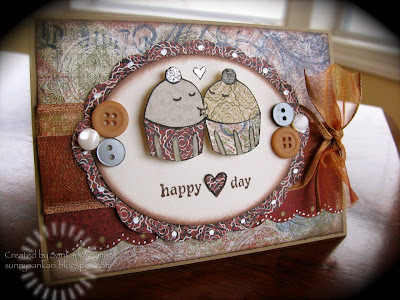 The thing that i like the best about her stamps is that she has sentiments that really fit everything you could want to describe and share in a card or layout or project. They are just so versatile. 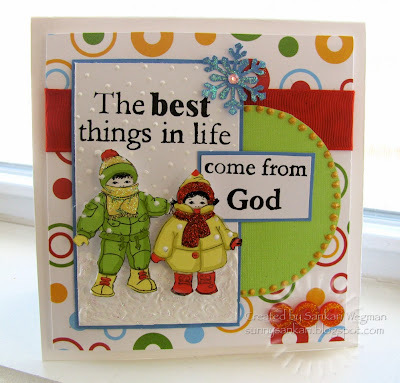 Please go check out Melanie's stamps and her awesome blog! She is not only an amazingly talented artist - but after having a chance to email back and forth and talk with her on the phone (we have to do it longer next time Melanie! :) she is just so sweet, kind and encouraging. I absolutely adore her! I hope your sunday is restful and relaxing!! My sunday is unfortunately looking like a laundry kind of day - oh well! :) Hopefully, I can get some stamping done too! When I watched this movie when I was young - my favorite character was the Tin Man - he was always so sweet and always getting rusty. My card is inspired by his quest for a heart. 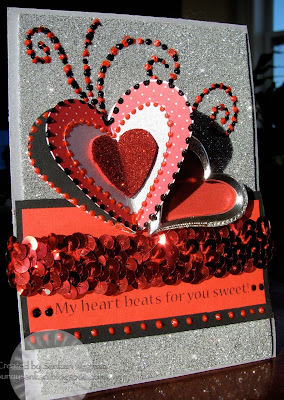 The sentiment of the card is inspired by the song "If I only had a Heart" sung by the Tin Man. I love the line: "I hear a beat, how sweet!" So this sentiment reads: "My heart beats for you, sweet!" I combined the silver elements from the Tin Man with the Ruby sequins of the Ruby red slippers that Dorothy wears. This card is super shiny and shimmery in real-life - it is so hard to photograph - but I tried. One of the hearts is very 3-D and the silver heart is actually a broach that I cut and adhered to the cardstock. This is an early valentine's day card for my DH that I surprised him with this morning - with some hot cocoa and pancakes :) Pancakes, hot cocoa and the Wizard of Oz ... that's what I call a great start to a day! I used the sketch that my fellow PaperCraftPlanet DT member, Jessica from iEmbellish from Gina K. created for the Saturday Sketch going on at PaperCraftPlanet. This week, all those who participate in the sketch challenge at PaperCraftPlanet will be entered into a drawing for a free stamp set from Gina K. (valued at $19.95) in honor of celebrating Jessica's birthday!!! So are you ready to play along!! We sure hope you join us this week! 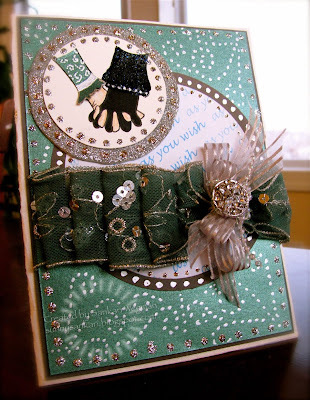 All of you have to do is make a card that has metallic component (brads, metallic paper, faux metal embellishment, etc) that is inspired by the movie Wizard of OZ and link your creation to our blog by commenting on this post. If you are uploading to SCS please use the keyword: CSCC16 and if you are uploading it to PapercraftPlanet - please use the keyword: cinemasaturday (all lowercase and all ONE word :). Please link to our blog by this Thursday, January 30, 2009 by 12pm PST. Please tell your friends about this challenge and have them join us in this fun challege. 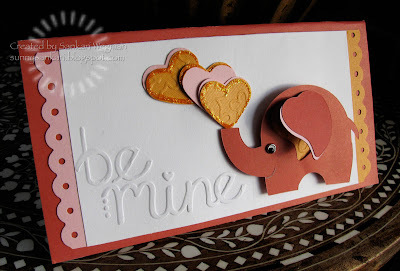 The card chosen from this challenge will be featured on PaperCraftPlanet - so come on and join the fun!!! Taylor's One Year Cupcake Anniversary Challenge!!! Wow! Two posts in one day already - and its not even 10am! This morning I am so excited to share some awesome fun that is happening over at Taylored Expresssions. I couldn't decide which cupcake to use for Vicki's awesome sketch! But I decided to go with one of my all time favorite ones: the Vampire Cuppie from the Halloween SASI set. He is just sooo darn cute! The sentiment reads: "Vil you be mine." The Be Mine sentiment is from Taylored Expressions and the first part I printed out from my computer. 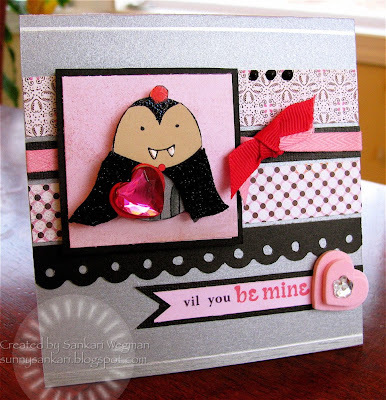 The DP is basic grey, the cardstock is from the Paper Company - and a little bling here, some glitter there and some paper piecings later - voila - Valentine Vampire made his appearance :) (maybe I should call him Edward after the whole Twillight series :) He was so much fun to create and I loved playing with Vicki's sketch. Also check out Dawn Easton of Treasure Oiler Designz and Laurie Schmidlin of Just Give Me Stamps - to see their awesome takes on Vicki's sketch challenge for Taylor's anniversary celebration! Don't forget to check out Taylor's blog, the anniversary celebration headquarters, for all of the sketch challenges as well as an awesome grand prize for one random winner who participates in ALL 9 sketch challenges! We hope you'll help us celebrate this yummy occasion! Have you ever had one of those weeks where you are running around and are catching your breath? Yep, that was my week and boy, am I glad that today is Friday!! Woo-hoo! 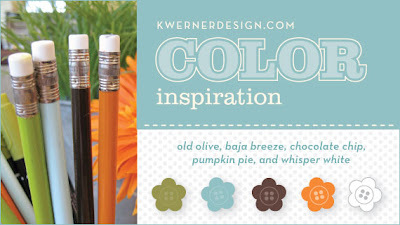 I loved the colors that Kristina Werner picked this week for her Color Inspiration Challenge #39. The inspiration picture of the gumballs came from a trip that she took to NY a while back. 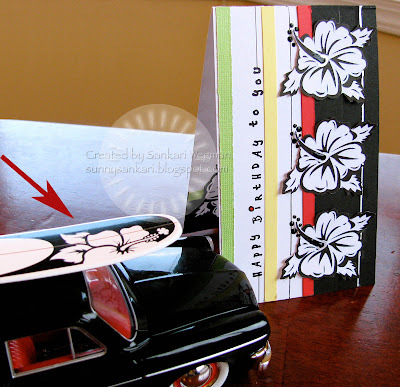 here is the view of the card kinda looking down at the surfboard image on top of the car. I really like how the surfboard was a black and white contrast with a line running down it - so I went with that and had lines of colors from the color inspiration running down the card too. 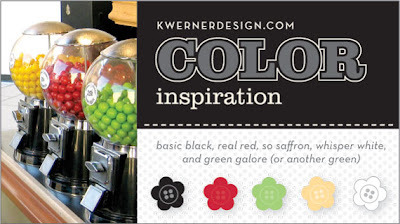 I can't wait to see all of the amazing entries from this color inspiration and to do a little blog hopping!!! Thank you all for visiting! 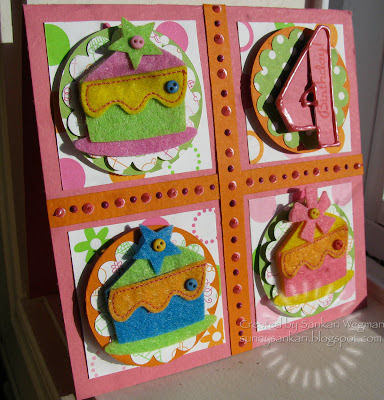 Stamps - Happy Birthday stamp is from SU! Every saturday, we pick a movie from which to draw inspiration from in creating a card, layout, altered project, etc. 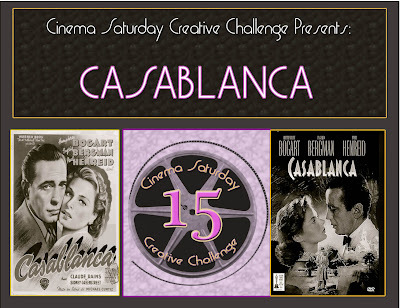 This Saturday, our Cinema Saturday Creative Challenge blog is featuring the movie Casablanca! We changed it up a little this week and included a color challenge: that has a black and white tones with one other color of your choice! Link your project to THIS post by 9pm PST on January 22 to be entered - and the card/project that is chosen - will be featured on PaperCraftPlanet!!! So come on and give it a whirl! I have to admit that this is a movie that I hadn't seen before - it has always been on my list (that's why I love doing these challenges - because I get to watch some wonderful movies that I hadn't seen yet!). Well, I watched this movie - this week - and just loved it - Ingrid Bergman - is just so very lovely to watch. I can't believe that it was released 67 years ago!!! WOW! What surprised me in watching it was that the famous line: We will always have Paris -- came from this movie!! Wow! I didn't know that - so when I was watching the movie and I heard that line - I knew right then that I wanted to make acard withat that theme on it. 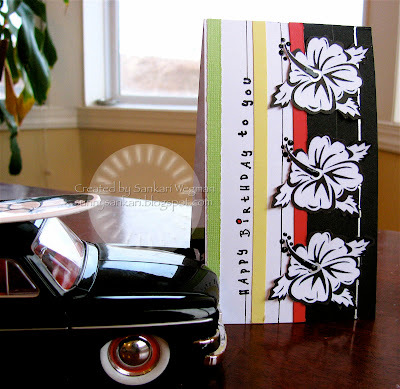 I used Julee's Mojo Monday sketch #69 for this card. I absolutely loved watching this movie and my most favorite thing was to call my dad who loves this movie and talk about it with him. Its always fun to see the movie through the eyes of my parents and what certain scenes mean to them. I will always watch Casablanca from now on with this conversation with my dad in my head. 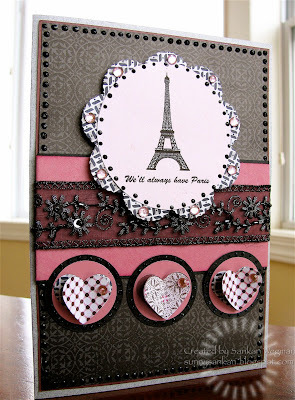 For this card - I knew I wanted to do something soft and black and white with something about Paris. 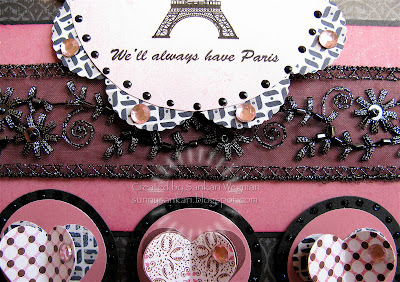 I was inspried by Kathie Bailey's beautiful Bonjour card for the last Mojo Monday and loved the color scheme that she used - it was so romantic - thank you Kathie :) I love watching a black and white movie - colorizing it somehow takes away something so special about that movie... I really enjoyed making a black and whtie card - and picked a pink tones for the "one other color accent"
Did you know that Casablanca is a 3 time Oscar winning movie (including Oscar for Best Picture) and was released in 1942 and has since then become an iconoic classic. It has been rated as the # 1 most romantic American movie by the American Film Institute!!! It was also rated to have the #1 most romantic kiss between Ingrid Bergman and Humprey Bogart! Well - that's alot of romance wrapped into one movie! 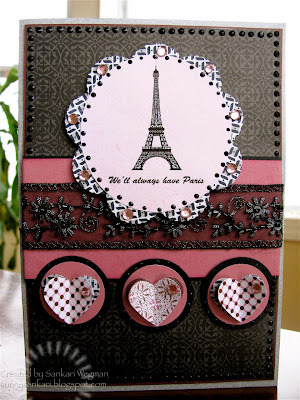 If you are inspired to make a romantic black and white card (with one other color) then come on over and play with us! 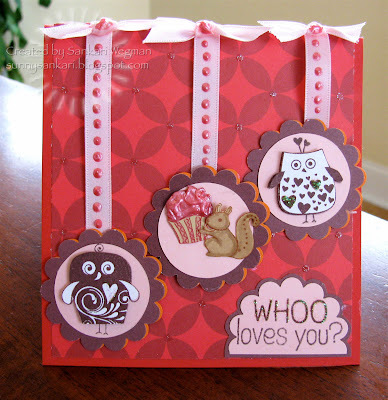 You never know - your card could be chosen to be featured on PaperCraftPlanet! I hope you all stop by the Cinema Saturday Blog !! 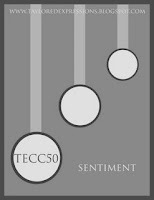 Just link up your black and white love creation to use by next thrusday 9pm PST and post it on the comment section here. Thanks so much for visiting me - make sure to also go and visit Brooke!!! I liked all the white with the little color in the inspiration piece - so I tried to keep it simple. I was trying to figure out some simple Valentine's cards to send out that I could make quickly in an assembly line - this might be one. I have totally fallen in love with this little elephant - my son has named this elephant "Sweetie" (he just turned 4 - and I totally love that he wanted to name the elephant Sweetie). Paper Company (pink: HInt of Dawn), DCVW orange, Red and white from stash. Movies watched: The movie for tomorrow's movie challenge of course! Hope your Tuesday has been fantastic... here things are on fast forward and I don't know how to press pause... I know its only Tuesday - but doesn't it feel like a Thursday? Anyhoo.. I just wanted to post a quick little something that I made while procrastinating on finishing up my presentation for my lecture tomorrow :) I have been loving looking at the projects that Pam and Carrie have been putting up at the 3D Design Challenge site - they always astound me - and I am so glad that I finally got to play along this week to the challenge of creating this treat pouch. This was a fun and quick project - I enjoyed making it and can't wait to try more... I am thinking I should make one for me for my craft table... but instead of making the pouch kinda teeny like I did here -- I should make it much much bigger - just for me :) LOL! Thank you for coming over for a visit! 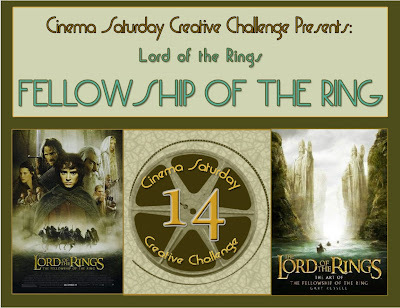 Movies watched while making this: Fellowship of the Ring --- again :) ! Do you need a mojo boost this morning? 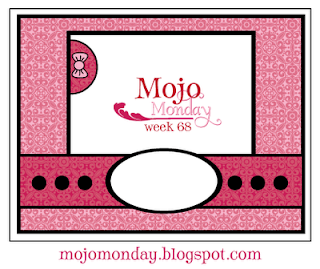 Then head down to the Mojo Monday blog and check out Julee's awesome new sketch! This sketch #68 on the left is from last monday (I am so glad I had a little time last night to play along! woo-hoo!). I loved all the samples of the Mojo Makers and couldn't wait to play along. 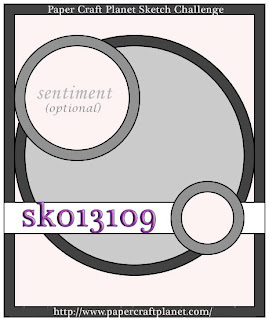 On the upper left corner of the sketch - there is a little half circle element - I thought of using this element as the "sun" in one card and as the "moon" in the second card. 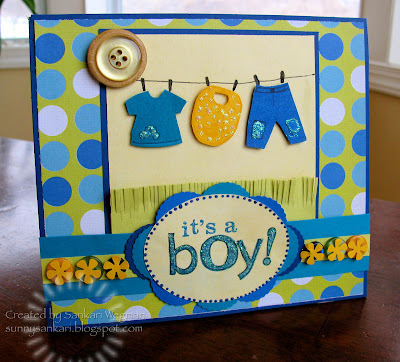 I loved the bright colors of this paper and it was so much fun to paper piece the little clothes on the clothes line - the button accent in the corner is to be like a the sun and there are sparkles in little spots in the card - from the clothes and also in the word "boy". Hope that you are all having a great Monday - I am off to check out Julee's newest sketch and I suppose I should do all that other stuff like clean up after breakfast, grocery shopping and working too - LOL!! Thank you so much for visiting this morning! Second of all, I have to thank Carol Dunston. I was so psyched when I asked Carol to be our guest designer for this week's challenge and she agreed!!! 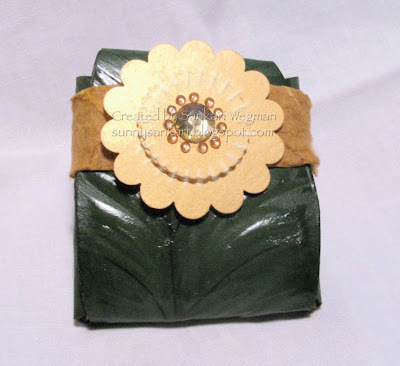 Carol is a wonderful aritste and I have always been inspired by her elegant and lovely creations. She is also the expert on the LOTR (Lord of the Rings) series. She created 6 cards for this challenge!! WOO! So we are showcasing her cards - a new one each day inspired by some aspect of the movie: Fellowhship of tthe Ring. When I sat down at my craft table - I had an idea to do the door to Moria for my card - but as I was doing it - it just seemed to get more and more like something that should be in the trash bin I was running out of mojo :) and so when I asked Carol if she had any ideas to spare - she sent me this link for Lembas bread. 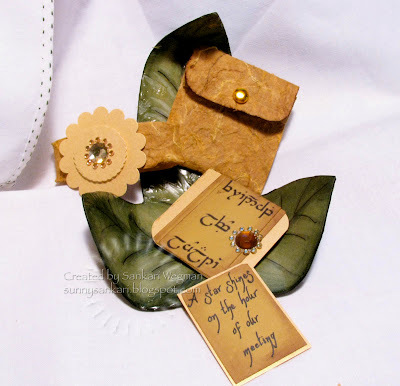 I originally was going to do another project (actually was working on it last night - when at some point I scrapped it because it wasn't coming out like it was in my brain - and so I turned to the next project I had in mind was to create a lembas card holder with a little note inside). 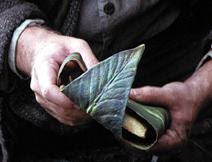 According to Tolkien, Lembas is a special bread created by the Elves that gave to the fellowship for immediate energy, lightness and nourishment. The are little like breadcakes, wrapped in a special leaf - in this way they last for months. 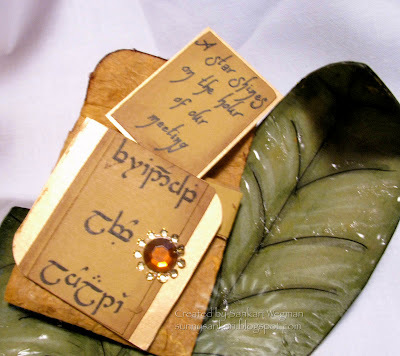 When the Fellowship left the forest belonging to the Lady of the Wood, they were given gifts for their journey onward - among them was Lembas bread. This part of the movie is seen in the Extended Edition of the movie (not seen in the theatrical debut of the movie). 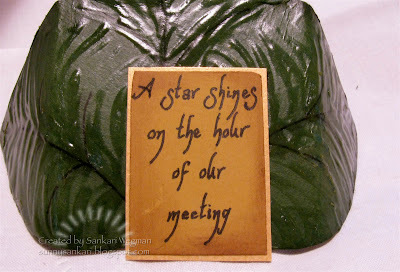 If you open this card witht the three words on it - then within that there is another little card that pops out - this little card within says: "A star shines on the hour of our meeting." which in Quenya is translated as Elen sila lumenn' omentielvo. I printed out the template given and cut out two shades of green cardstock with the template and drew the veins of the leaves in black. 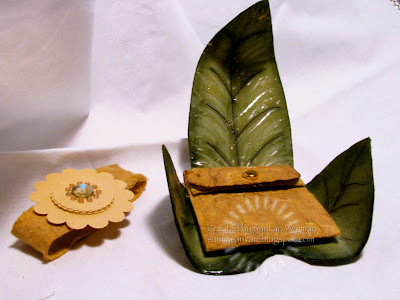 I sponded Stazon Olive on the sides and inside of the leaf holder (it is lighter on the inside). 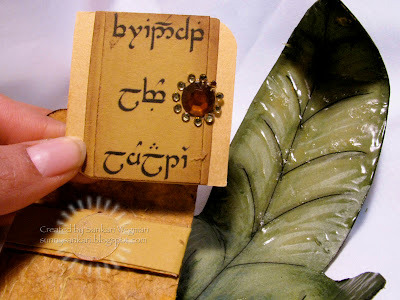 Next to create a shiny kind of effect and texture for the leaf, I painted it with an acrylic glaze. 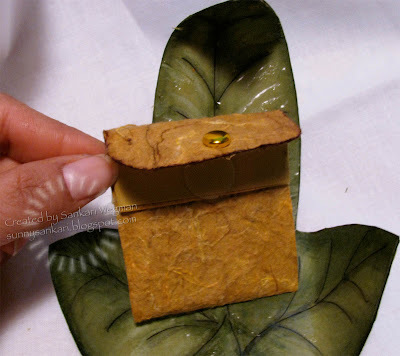 The inside of the leaf where the lembas bread would go if folded is about 2 x2 inches. 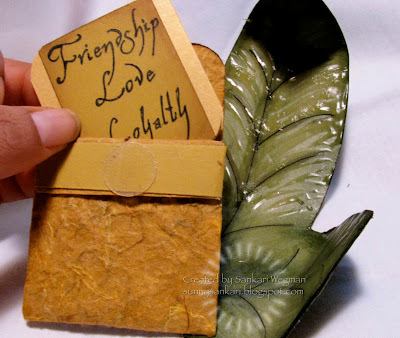 So I created a little pocket wallet that had the texture of bread that opens up to a "card" that looks kinda like a little piece of Lembas that on one side has the Elvish language that Tolkien created - that says: Friendship, Love, Loyalty and the translation of the English words on the other side. I thought these three words really summerized some themes in the movie - the Friendship between the 4 hobbits and the seeds of friendship and fellowship that are planted in this movie (the friendship between an elf and a dwarf, among all the races... (in the end when Boromir and Aragorn come together as brothers...(sigh - always cry at that part ), the Love between Aragorn and Arwen, the loyalty that is tested, betrayed and then re-affirmed amongst the fellowship - these themes are so beautiful and lovely portrayed in the movie. Inside this little card - is a little note that says: A star was shining upon the hour that we met. This is an Elvish greeting and I just thought it was so beautiful. I know just the person who I want to give this little card to - and I know there definitely was a star shining upon the hour that I met him :)! I had a lot of fun watching this movie, delving into Tolkien's magical land and chatting with fellow admirers and fans about this movie. I hope you have a chance to see this and all the other movies in the Trilogy and also that you have a chance to play along this week. 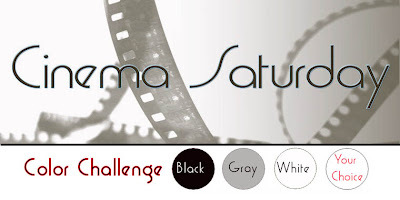 To play along its simple - just pop on over to the Cinema Satruday Creative Challenge blog and leave a comment on this post!!!! Please hop on over there and check out Carol's beautiful creations - also we will be posting a new card of hers everyday - so check in during the week too!!! Alright my dear friends! I hope you enjoyed! Best wishes and big thanks to everyone!!! InK- for sponging, Adirondak expresso and Staz-on old olive. Julee's first challenge was a color challenge to use the colors of red riding hood, kraft and blush blossom. I had to try Lynn's technique this week over at SCS to use tack strips and glitter - boy, was she right when she suggested to make this card when you are not around kids or pets!! I got a ton of sparkles all over me - but hey - who doesn't love that! 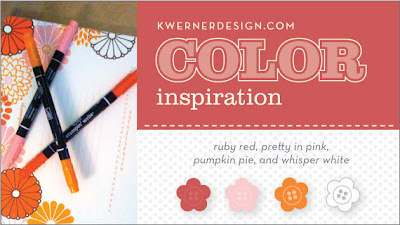 (The DP is from K&CO, cardstock from DCVW, liquid pearls, sponge, corner rounder for scallops). 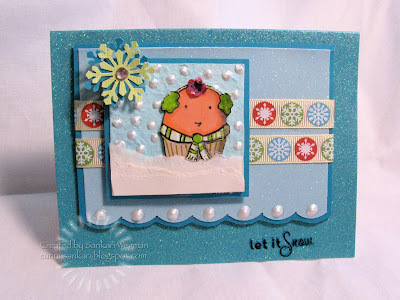 This next card was made for the third sketch challenge and for this challenge, I made this Let It Snow cuppie from Taylor's stamps - I realized that this little guy had not yet been inked - and that is just not right!!! This cute little cuppie is from TayIor's Season's Sweetings set . I created a little scene for cuppie with some threading and liquid pearls. Both the dark and light teal cardstock are super glittery and so this card is very sparkly IRL.. (the papers are from DCVW, the ribbon from K&CO., Martha Stewart snowflake punch, bling from stash, liquid pearls). 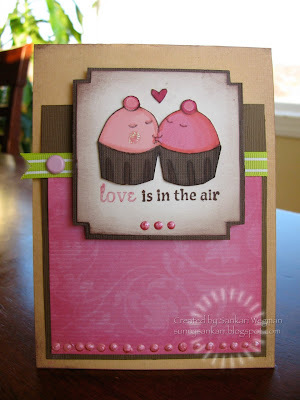 hmmm... its official - I love stamping with cupcakes :) Actually, anything with cupcakes is just adorable!! Another reason I love Fridays is that we do our Friday Sneak Peeks over at our Cinema Challenge blog - see if you can guess which movie we are going to pick for tomorrow's cinema inspired card from the sneak peek that is posted there!!! Have a wonderful Friday my friends!!! May it be filled with cupcakes, cakes and all sorts of sweet wonderfulness!!! I stamped the image on the different color cardstock from the colors of the inspiration challenge and then paper pieced it all together. There's a touch of Crystal stickles on the top of the cuppie, but I don't think the photo captures it. 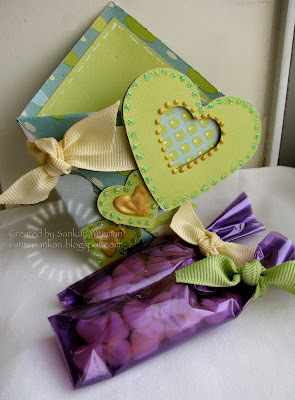 I cut out a heart shape and then paper pierced around it twice giving interlocking hearts. I also paper pierced the chocolate brown paper. 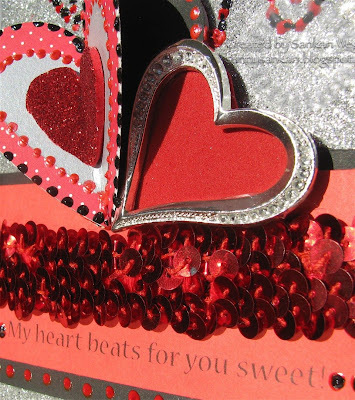 The scalloped edging was done with a circle punch, and the bottom edges of the card were corner rounded. Can ya'll believe its Thursday -- seriously - where did this week go? Hope you are all having a fabulous day! Thanks for coming over for a visit! This is a little birthday card for one of my son's sweet playmates who is turning 4 in less than 2 weeks. 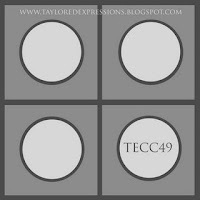 Loved Taylor's sketch with thisythe four squares for this - it was perfect!! 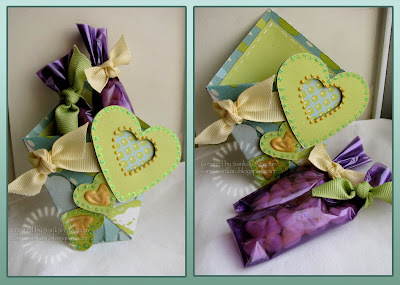 All the papers and cardstock are from Taylor's Birthday Girl Key Ingredient's Kit. The card is cut to 5"x5" and the squares are 2"x2" . I made the number 4 by folding a strip of paper and then stamping the "birthday" sentiment on the leg of the number 4. The stamp is part of Taylor's Sweet Celebration kit. Check out her new releases here! Hope this post finds you all in good health and happiness! How are you all doing on your New Year's resolution... 3 of mine were forgotten by lunchtime on January 1st... the rest are going okay :) Come and check out this week's movie challenge on Cinema Saturday - we are doingthe movie Mama Mia from which to draw inspriation to create a card, layout, anything - so come over and check it out!! Wishing you all a fantastic start to your week!! !